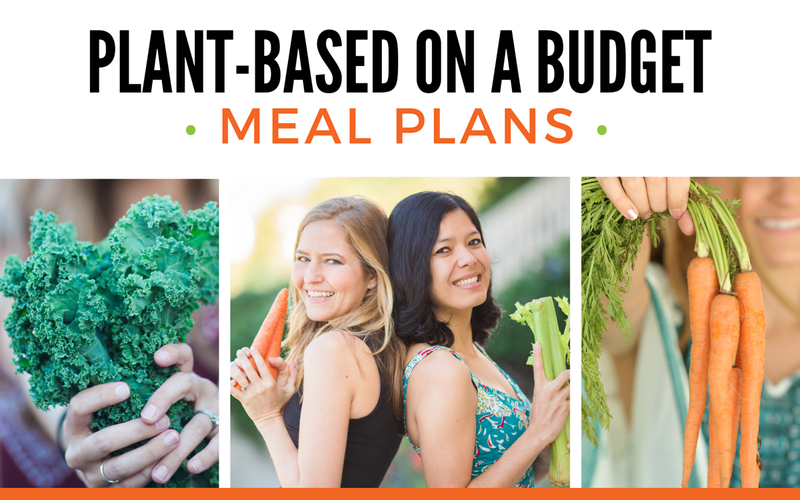 Want to save money, save time, and build healthier eating habits? You can do all three by preparing your lunch the night before! 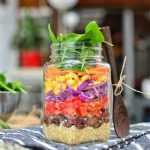 If you don’t have much time on your lunch breaks but still want to eat something nutritious, go for a rainbow salad jar. They’re awesome! Now more than ever we need to be conscious of how wasteful we have become and focus on the little things we can do to make a difference. Ditching plastic containers whenever we can is one of those things. Glass jars (like these wide-mouth mason jars) are a great way to carry your food around! 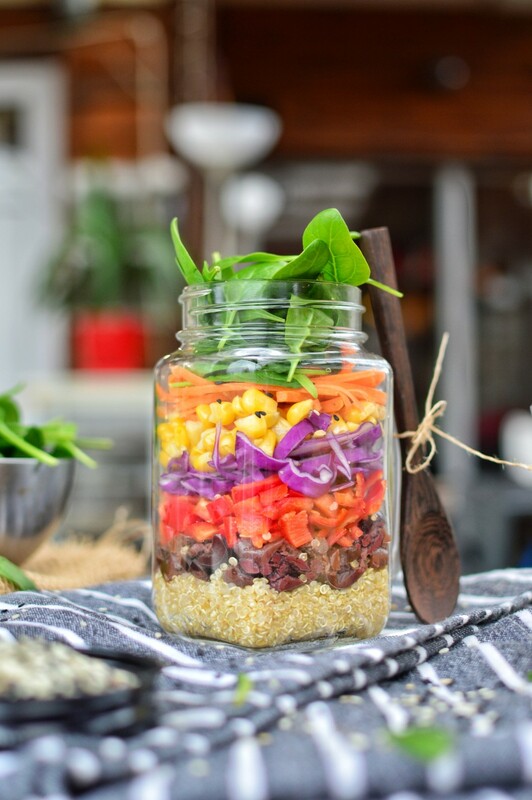 It could be this rainbow salad or your morning smoothie or even those overnight oats you prepared the night before. Throw the jar in your bag in the morning and you’re off! Salads are a fantastic option to take to school or work (or even a picnic! ), either as your main meal or a healthy side dish. A salad full of colors and fresh ingredients will fill you up but not to the point where you just want to lie down and take a nap. 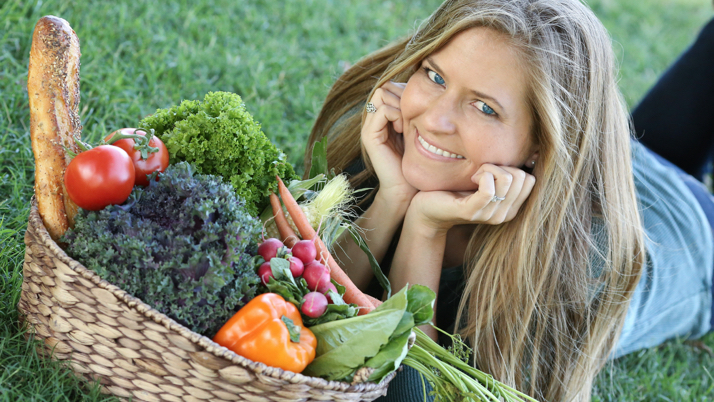 All those vibrant veggies will give you the energy you need to finish up your day. 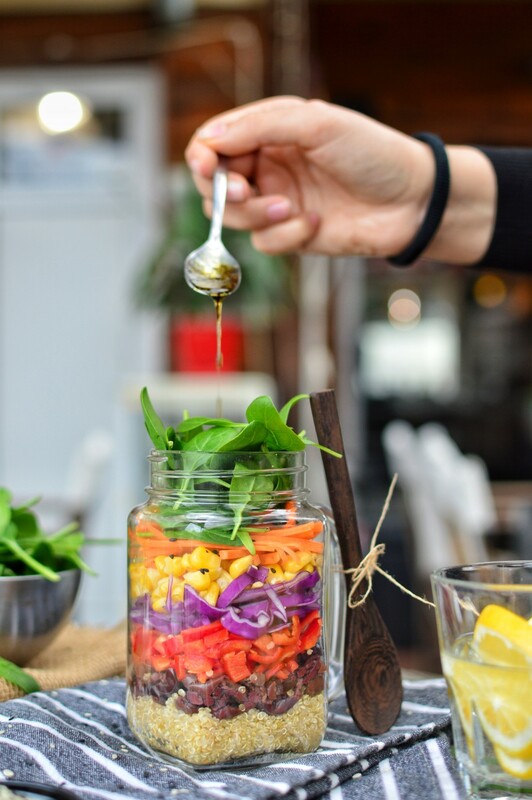 You'll love this healthful and colorful rainbow salad in a jar. It's incredibly versatile—you can use any veggies, grains, beans, and dressings you have on hand. Enjoy! Cook quinoa the night before. You can make a big batch and store it in the fridge to use in meals throughout the week! In order to get the best fluffy quinoa, first, wash it with cold water through a sieve and then fry it a pan with a little bit of oil for 3 minutes. Then add the water and a pinch of salt. As soon as the boiling starts, lower the heat to medium and cover with a lid. Let it simmer for 10 minutes, and then take it off the heat and let it stay with the lid on for another 5 minutes. Take the lid off, fluff it up with a fork, and enjoy. 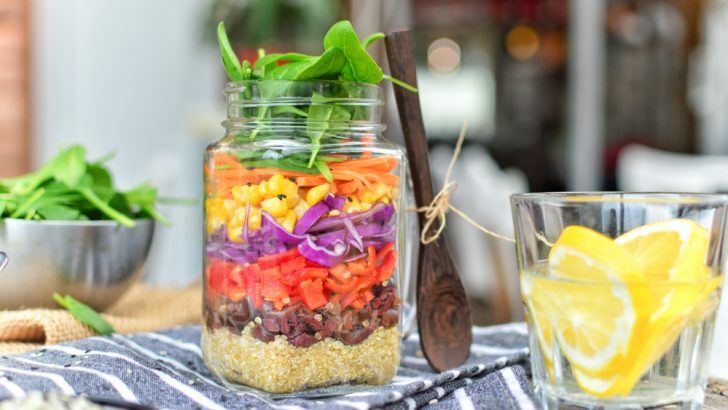 And then you just need to assemble the layers in your jar as shown, with quinoa on the bottom, followed by chopped olives, chopped peppers, chopped cabbage, sweet corn, shredded carrots, and spinach on the top. The order is important, with the more moist and heavy ingredients on the bottom and the more delicate ingredients like the lettuce leaves on top so they don’t get soggy. It’s good to have a dressing to enjoy on your salad, but you’ll want to pack it in a separate container so your salad doesn’t get soggy. Rainbow Salad: As Simple As It Gets! This rainbow salad is an explosion of color and flavor. Crunchy cabbage, salty olives, sweet carrots, and earthy quinoa make this dish perfect! You can choose any dressing you’d like. It could be a simple vinaigrette, a creamy cashew ranch, or a delicious tahini-lemon-garlic drizzle (we’ll get a recipe for that up soon!). Just put your dressing of choice in an airtight container (such as these) and take it with you. When you’re ready to eat, you can either dump the salad onto a bowl or plate and give it a thorough mixing with your dressing, or enjoy it straight out of the jar. If you are eating it from the jar, pour in the dressing, close the lids, and shake it well so the dressing coats your veggies from top to bottom. Okay, now it’s ready to eat! The only thing you’ll need to cook for this easy vegan lunch idea is the quinoa—and we’ve got tips for that down below. Quinoa is widely loved because it’d considered a complete protein, meaning it contains all the essential amino acids we need to get from our food. Although you can really use any cooked grain in this recipe (rice, quinoa, or even pasta). You’re also welcome to add in beans (such as pinto beans or garbanzo beans), grilled tofu, seeds, or whatever other salad toppings tickle your fancy. In order to get the best fluffy quinoa, first, wash it with cold water through a sieve and then fry it a pan with a little bit of oil for 3 minutes. Then add the water and a pinch of salt. As soon as the boiling starts, lower the heat to medium and cover with a lid. Let it simmer for 10 minutes, and then take it off the heat and let it stay with the lid on for another 5 minutes. Take the top off, fluff it up with a fork, and enjoy. Many people are tempted to take the lid off early to check on the quinoa, but resist the temptation! Don’t take the lid off and fluff the quinoa until the very end. If you’re prepping this the evening before, you can also enjoy a bed of quinoa for dinner topped with a tofu and veggie stir fry! So, are you tempted to try this idea? Go for it! And remember. The rainbow salad is not the only way to fill up your jars. If you’re not inspired to cut up veggies and cook some quinoa, you could make a budda bowl Jar instead with some leftover rice from the day before, seaweed, avocado, tofu, and some sprinkled sesame. Or, make some overnight oats the night before and add some banana in the morning along with all your favorite toppings. The possibilities are endless! 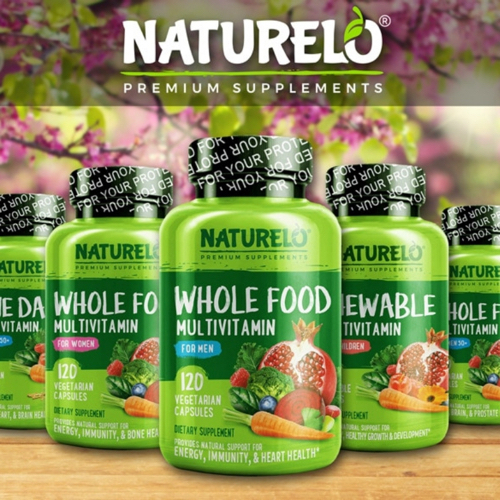 Give zero waste on-the-go…a go! 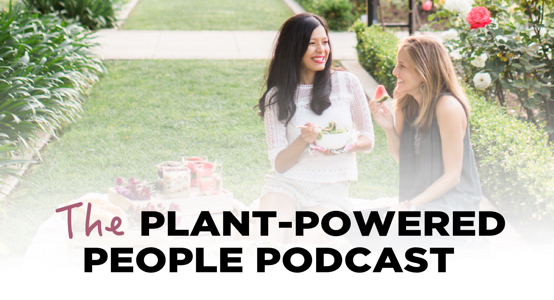 Inspired to try more salads on the go? Check these out! 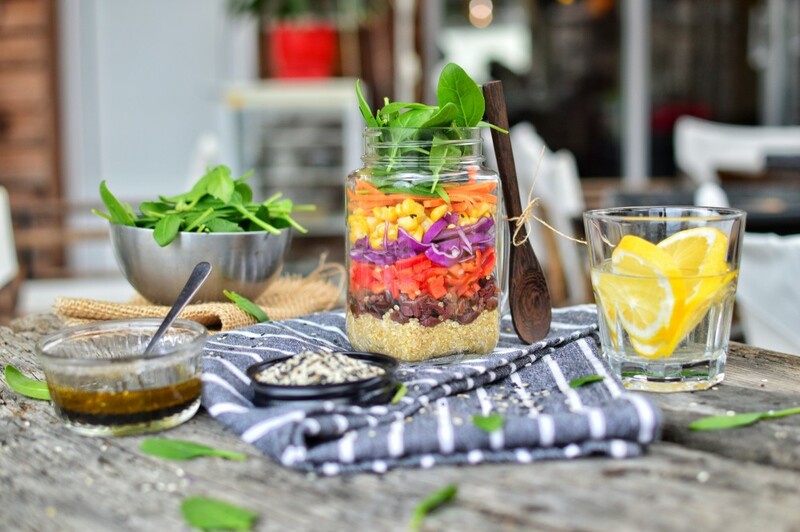 Rainbow salad in a jar photos by Zhoro Apostolov for World of Vegan. Recipe and photographs copyright of World of Vegan™, all rights reserved. Please note that this article contains affiliate links which means shopping through them helps lights on at World of Vegan! Chef Zhoro is an incredibly talented plant-based chef and food photographer with 12 years of experience in professional kitchens. Chef Z lives in Bulgaria where he shows his fellow citizens how tasty vegan food can be. You'll find him organizing brunches with delicious food and showcasing his latest on Instagram @TopFoodFacts. Find more of his work at TopFoodFacts.com.